So for at least the past week I have been wanting carrot cake -- I'm not sure why but I'm chalking it up to pregnancy cravings. I finally had a halfway decent excuse to make one since we were having friends over for dinner. While I love the carrot cake cupcakes I've made in the past, I wanted to try a new recipe that used pineapple since I had some crushed pineapple in the fridge that I needed to use up. (The cupcakes are a great recipe to try if you prefer your carrot cake sans additions.) It was an excellent decision, I found an Ina Garten recipe that used pineapple (although it called for fresh but I subbed in the canned that I already had) and it also added in raisins and walnuts (although I made another substitution and used pecans since I had those in the pantry). Just make sure if you do use canned pineapple that you get the kind packed in its own juice not heavy syrup, you don't need to add extra sugar to the recipe. It turned out to be really moist and topped with a cream cheese frosting, a perfect choice to satisfy my craving. This cake is really forgiving, there's no complicated mixing instructions, you don't have to sift flour and most of the ingredients you probably have on hand. I also added some extra spices to the recipe. It originally called for cinnamon but I added some ginger and nutmeg as well. 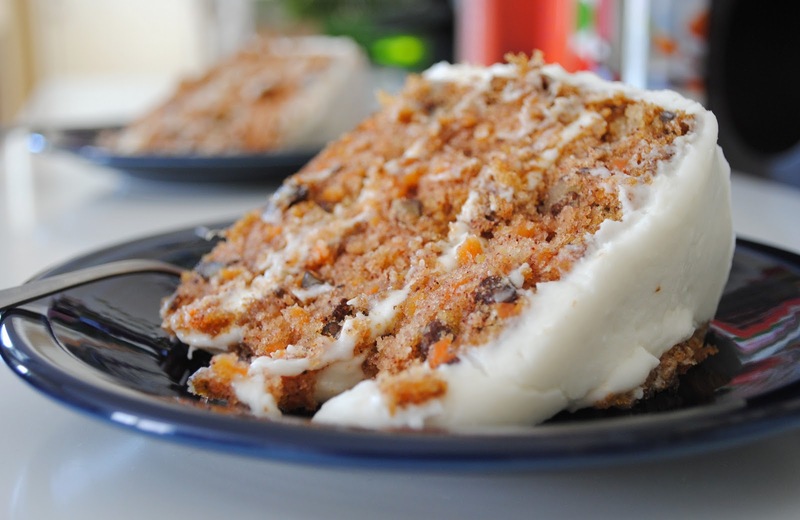 A thick cream cheese frosting is always a good combination for carrot or other spice cakes and is really easy to whip up. I used my normal cream cheese frosting which has a 1:1 ratio of cream cheese to butter. To that, I add vanilla, milk or cream and powdered sugar. Make sure you whip the frosting really well to incorporate plenty of air, this will help give it a light texture and make it the right consistency to frost your cake. I did end up with about an extra cup of frosting even after converting this from a 2-layer to 3-layer cake. The original instructions were to use 2 8-inch pans but unless your cake pans are deeper than standard cake pans, I think you would have overflow problems, I split it into 3 8-inch pans and thought the layers were still pretty substantial. They do bake up pretty flat so there was no trimming required to assemble. Preheat oven to 350 degrees. Butter and flour three 8-inch round cake pans (or you can use baking spray) and line with parchment paper if desired (I didn't and it came out just fine but with a more delicate cake or if I'm not just making it for myself, I usually do). Combine sugar, oil, eggs, and vanilla in a mixing bowl and mix on medium speed for about two minutes until light yellow in color. In a separate bowl, combine flour, soda, cinnamon, ginger, nutmeg and salt and whisk together. Add to mixing bowl and mix on low speed until just incorporated. Batter will be pretty thick at this point. Toss raisins and pecans with remaining one tablespoon of flour. Fold raisins, pecans, carrots and pineapple into batter until well distributed. Divide batter evenly among pans and bake about 30 minutes until a toothpick inserted in the center comes out clean. Cool in pans about ten minutes and then transfer to wire racks to cool completely. Combine cream cheese and butter in mixing bowl and beat on medium-high speed about three minutes until light and fluffy. Add vanilla and first three tablespoons of milk and mix on low to incorporate. Slowly add powdered sugar, mixing on low until incorporated. Increase speed and whip about two minutes, adding additional milk if necessary to reach desired consistency. When cakes are completely cool, spread about 1/4 of the frosting on top of the first layer, spread evenly, top with 2nd layer, add another 1/4 of the frosting and top with remaining layer. Add a generous amount of frosting to the top of the cake and smooth working out with a spatula to the edges and down the sides of the cake. Cream cheese frosting is my weakness! I love carrot cake and Ina Garten! Looks delicious! I've never tried carrot cake before. But this looks very tempting! 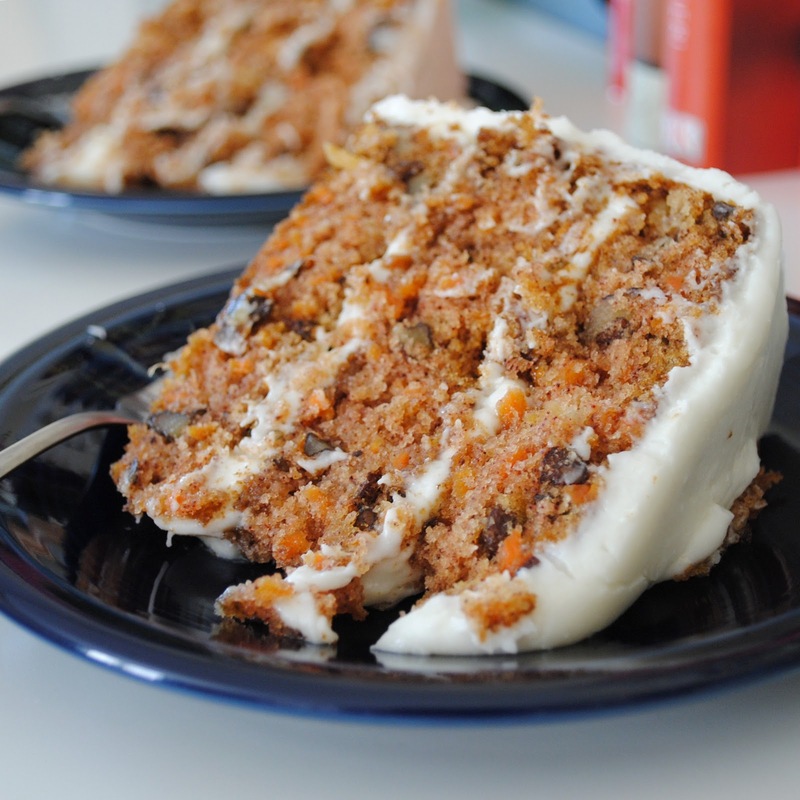 I just love carrot cake and this recipe sounds so good. Your pictures are fabulous! Lovely recipe and great images! I shared this post on my blog http://potsoup.wordpress.com/2014/03/15/eating-to-relax/. Carrot cake's my idea of comfort food. Making this today for my honey. Carrot cake is his FAVORITE!!! Made this today for my husband and it was amazing!!! Great recipe!! I cannot have pineapple, will it ruin or change it if I leave it out? is there a substitute?